Fireworks and Fourth of July go together like presents and Christmas. But unlike those red and green wrapped gifts enjoyed by all, fireworks are anxiously anticipated and a huge source of confusion and angst for many. While firework distress is commonly discussed in the context of pets and young kids, they are also of major concern for many dementia patients and elderly loved one. 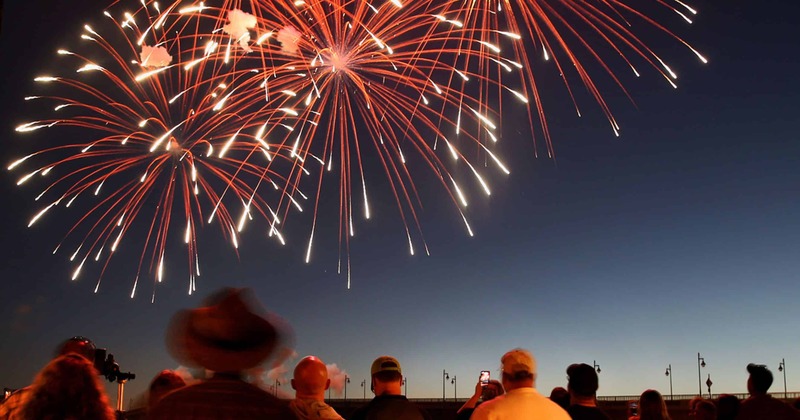 The tradition of fireworks while celebrating Independence Day isn’t going away, so what can be done to help ease the anxiety and confusion of elderly people and dementia patients during the fireworks season? According to USA Today, over one billion dollars is spent annually on fireworks for the Fourth of July. That’s 285 million pounds of explosives each carrying an average of 150 decibels of sound, the same sound level of a jet plane taking off and significant enough to cause ear drum rupture. Fireworks are both audible and felt in vibrations when launched with these decibels. It’s no wonder that Fourth of July celebrations can cause distress to our elderly and people with dementia, but there are some ways that caretakers can help. Talk about the fireworks prior to the holiday. Remind your loved one that the celebration is coming up and that they may begin to hear fireworks. If your loved one lives alone, leave a note in places they will see that they will be hearing and possibly feeling fireworks. In the case of memory loss, this will serve as a consistent reminder throughout the holiday. If you use respite care or they are with a caregiver, remind that person to discuss the upcoming celebrations and fireworks with them. Go over any past problems and discuss the best way to keep your loved one calm this year. If you will be with them, suggest ear protection, play comforting music, turn on a fan for white noise and have an exit strategy if the experience is too overwhelming. People who suffer from Sundown Syndrome are especially susceptible to firework distress as both incidents will occur at nearly the same time. Keep them inside a well-lit home until after the fireworks are done. In cases of loved ones with significant ongoing anxiety, talk to their doctor prior to the Fourth of July and understand what symptoms demand medical attention. The Fourth of July is a time for celebration and summer fun. Worrying about your loved ones during the holiday can be a significant concern for family caregivers. If you need additional information or professional caregiver assistance please call us anytime at 419-754-1897.